To start, I'll admit that when I read this, I wasn't in a real position to leverage everything that was being talked about, which is likely why I didn't give it higher than an 8. 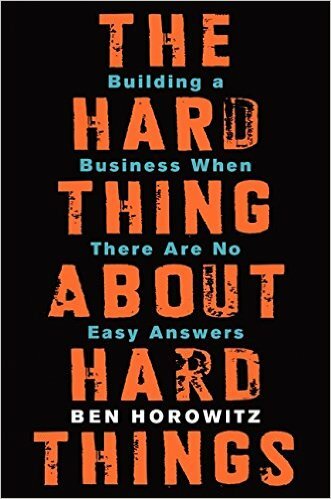 That said, this is the kind of book you refer back to throughout your life in business, and I think it has the most relevance for a) an entrepreneur who is scaling up, and building a large organization, or b) someone already working in a large organization, managing a relatively large department and therefore number of people. Very actionable advice in many areas, and certainly well thought out and methodical. Definitely recommend, just keep in mind the ideal reader profiles above. "This is not checkers, this is motherfuckin’ chess"
When you are building a company, you must believe there is an answer and you cannot pay attention to your odds of finding it. You just have to find it. A good culture is like the old RIP routing protocol; bad news travels fast; good news travels slow. If you run a company, you will experience overwhelming psychological pressure to be overly positive. Stand up to the pressure, face your fear, and tell it like it is.